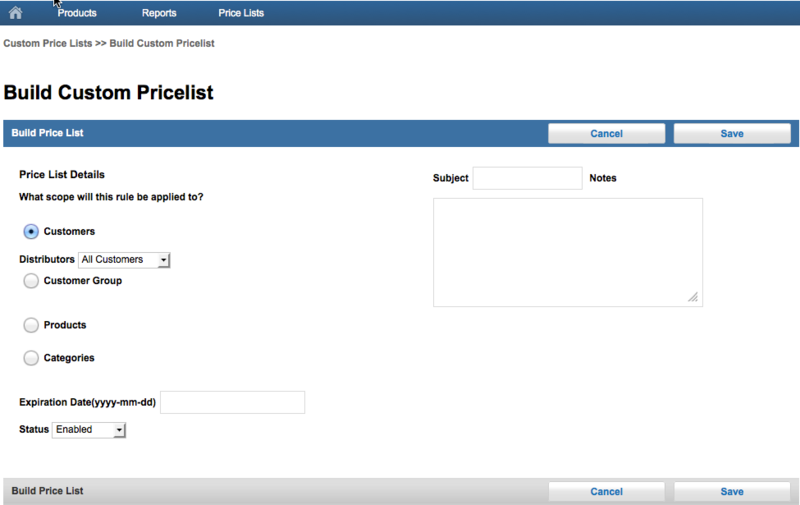 Step 2 – Fill out the fields on the Build Price List: Select Customer or Customer Group. Step 3 – Select All Customers or Single Customer from the Distributors Dropdown. If you select Single Customer you will be prompted to the right to enter customer name. Step 4 – Choose the area that you want to set pricing for: Product or Category, Enter Expiration Date, Choose Status, Enter Subject, and Add Notes. Step 7 – Under Special price Setup, use the dropdown to select your Price Listing type. The new Price List will be added to the Custom Price List database.